This impressive floral gift is a true work of art. 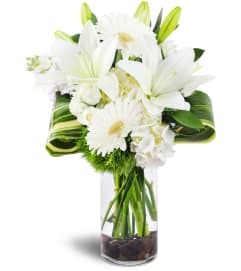 Perfect for a tasteful corporate gift, an over-the-top hostess gift, birthdays, "thinking of you" sentiments, and much more, this arrangement aims to please. Gorgeous white cymbidium orchids, roses, and Song of India are creatively arranged with curly willow, aspidistra, viburnum berries, and cherries for a stunning effect. 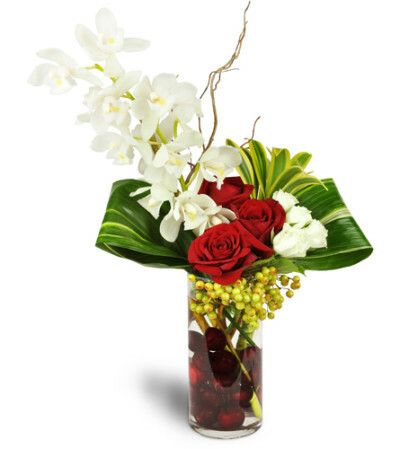 White mini cymbidium orchids, red roses, spray roses, and Song of India are arranged with curly willow, aspidistra, viburnum berries, and cherries in a clear cylinder glass vase. Have been very happy with the service. Have used for many years. 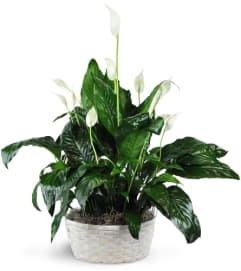 My sister was very pleasantly surprised and said the flowers were beautiful and fresh. Good selection, beautifully presented in a reasonable price range... can't ask for more. Very nice arrangement and pleasant conversation when I called. 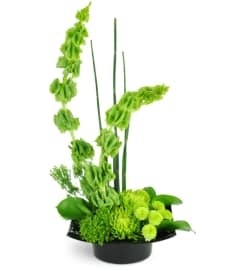 Flowers by Reni is a Lovingly Florist in Fishkill. Buying local matters. Discover how Lovingly supports local florists. Copyrighted images herein are used with permission by Flowers by Reni.